Times change and so does design technology. Well considered and thought out design can be timeless but the underpinning technology never stands still; not for an instant. More often than not however, most of us will have to resign ourselves to the fact that periodically our presence both online and off are going to require a rethink and refresh both in design and technology. 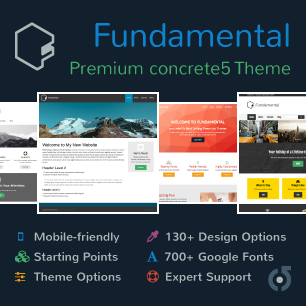 The horizon looms with the latest incarnation of concrete5’s ever impressive content management system (5.7) - so there seemed like not a better time than the present for the concrete5 in-house development team to revisit concrete5.org, inside and out. concrete5.org has huge amounts of indexed pages and rising; so to conjure up a responsive, contemporary, aesthetically pleasing solution whilst attempting to be bang up to date on trend utilizing the latest technologies, was never going to be easy, nor for the faint hearted. Pretty good, we think. Certainly a step in the right direction, that’s for sure. The site now benefits from a responsive layout which from our initial inspection appears to be in the early stages and is only currently functional on some pages. Encouraging all the same. Hopefully over time we will see this filter down throughout the entire sitemap. The pages are now a lot cleaner than before with fresh typography taking a more modern twist throughout. Well defined sections take precedent on the homepage; making for a much less cluttered design layout but the choice of imagery leaves a little to be desired. The whimsical nature of the previous design has been toned down considerably with just enough left over to add a personal touch. A much more professional look has been achieved. What do you think, has it been a success? The true measure of success will become more apparent over the coming weeks and months as the update beds in. Only the concrete5 team will truly know if they have reached their predefined goals and targets and if they feel they better represent their own vision and intended market for their undoubtedly fantastic product. Only time will tell. Onwards and upwards, here is to the future of concrete5. Long may it continue.